SC-402 2-1/4" High Cowl Induction x 41" long (82-93 S-10) with center ridge. SC-403 2-3/4" High Cowl Induction x 43" long (94-02 S-10 style) smooth top and front is curved to match 94-02 S-10 truck. SC-404 3-1/2" High Cowl Induction x 43" long (82-93 S-10) with center ridge. SC-502 1955 Chevy, 2 Lane Black top Scoop. Internal flange for mounting to 55 hood. SC-101This is a full size replica of the original Ford Thunderbolt tear drop bubble. It features a full flange for attaching to the hood of your choice. Standard mounting is with openings to the rear, but can be mounted in either direction and the two air inlets are fully trimmed open. No screen is supplied. 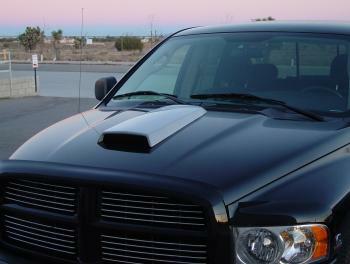 Reverse Teardrop Hood Scoop, fiberglass. SC-102This is your Hemi-Cuda scoop. It features an exterior flange to aid in mounting. This is not the Shaker scoop, and is to be mounted on the top of the hood, not to the carbs. 2" high clearance in rear. SC-1023 This is a modified version of the Hemi-Cuda scoop. It has the same dimensions as the SC102, but features an interior flange to aid in mounting. This is not the Shaker scoop, and is to be mounted on the top of the hood, not to the carbs. With the addition of special carb plates, this scoop can be used as a shaker. 2" high clearance in rear. Similar dimensions as SC102, but no outer flange. This scoop was original equipment on early AMX. It features a full 1 inch exterior flange for mounting. Most applications of this scoop are on flat hoods. Replica of the famous '67 Vette 427 Sting Ray scoop. It has a full open construction which allows air to enter from the front or rear. Quality hand laid fiberglass is used throughout to insure durability and ease of painting. Replica of 69-70 Cobra Jet Mach-1 Mustang. It eliminates the turn signal lights which are mounted in the rear of the scoop. Full outside flange aids in riveting or bolting to your hood. This scoop can also be molded in for that finished look. This scoop was first found on 63-64 Mopar, Max Wedge or Ramcharger. Not a snorkel type, but this popular scoop features a full exterior flange for mounting to original steel or fiberglass hoods. Same as SC106, but has inside mounting flange. This popular scoop features a full "INSIDE" flange for mounting to original steel or fiberglass hoods. Another popular scoop is this 65-66 Shelby Mustang style. Designed to be riveted or molded to the hood, it has an exterior flange for easy mounting. Width is 12" (14" including flange). Length is 27" (28" including flange). 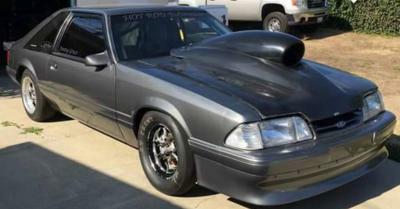 Late Model Mustang Scoop. Close replica of similar scoops costing 3 times as much. Made from hand layup fiberglass, smooth gray gel coat finish for easy painting. Underside has 1-1/2" wide mounting flange. Mounting flange has 1/4" curve for mounting to late model Mustangs and others. 12-1/2" wide (overall width) in front. 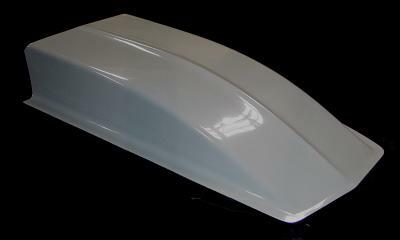 This scoop is designed to fit the 87-92 Mustang hood. It is the same scoop that is on our MU728 hood. Height is 2 1/4. Overall length is 47". Overall width is 31" at the back (including outside mounting flange). Flange size is 1-1/4", leaving actual scoop width of 28". Scoop tapers toward the front, making width 22" at the front (including flange), leaving actual scoop width of 19" at the front. Our most popular scoop, this replica of the notorious Z28 Camaro cowl induction, features a full 2 1/4 inch height. Designed to be riveted or screwed on to an original steel hood, it can also be glassed and molded into any of our fiberglass hoods. 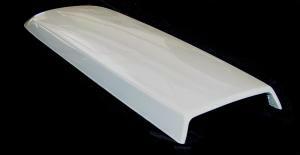 This scoop features the same fine qualities as the SC108, but is an additional 6 inches longer. It is most commonly attached to larger hoods like 68 Fire-bird or 70-81 Trans-Am. Unlimited Product's exclusive. This cowl induction scoop offers 3 1/2 inches of rise, and with a length of 56 inches, it will cover most air cleaners. With this added height it allows user to move scoop toward windshield without interference with wipers. See SC114 for version that is 49 inches long. Another Unlimited Products exclusive. This scoop has been specially designed for mounting to shorter hoods like 67-69 Camaros. It reaches a full 3-1/2" height at 19" from front and will clear most high rise carburetor applications. SC-1143 Has ridge along center. Cowl induction scoop at it's tallest: 4 3/4 inches high! Outside flange for riveting, bolting or bond-on mounting. 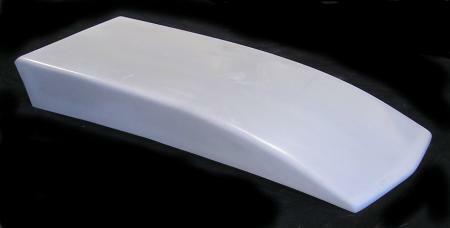 This scoop features full hand laid fiberglass construction and has reinforced rear edge for rigidity. This scoop is an Unlimited Products exclusive. Edges are double thick to accept countersunk rivets for flush bonding to your hood. Edge length is 49", while overall length (including rear overhang) is 52". SC-1153 Smooth top. 4 3/4" HI 49" LONG, with inside flange (21" wide at top. 23 wide at bottom) Smooth top, no ridge. Entire scoop has a slight curve (when looking at it from the side view, mid point is bowed up 5/8"), this allows it to set neatly on almost all hoods. Bolt kit and instructions included. 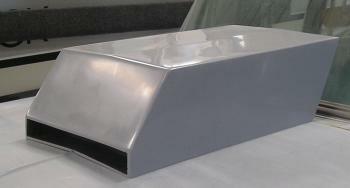 This Scoop is a copy off our GM-228 (hood for 73-80 Chevy pick-up). It features the exact curve to match the 73-80 Chevy truck hood. Overall width in the front is 24". This 24" includes the flanges. Actual scoop is 21-1/4" wide at front (not including flange). Rear width is 27" at base (including flange). Actual scoop is 22" wide at rear / top. 5" high X 21 wide. Base is 29-1/2" wide. Length is 50". Has outer flange. These dimension do not include the outer flange. Newest Cowl Induction Scoop. Features Wider Base to clear newer induction systems. Has ridge down the middle. 5" high X 21 wide. Base is 29-1/2" wide. Length is 50". 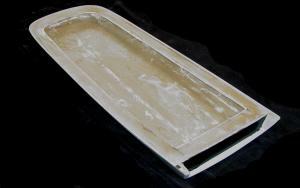 This scoop features an internal mounting flange. Newest Cowl Induction Scoop. Features wider base to clear newer induction systems. Has ridge down the middle. 56" long, 5" high X 21 wide. Base is 29-1/2" wide. Has outer flange. These dimension do not include the outer flange. Newest Cowl Induction Scoop. Features Wider Base to clear newer induction systems. Has ridge down the middle. 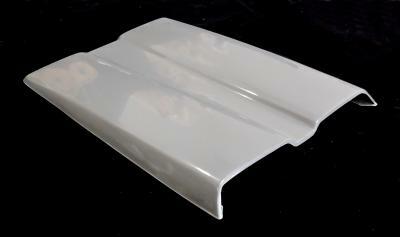 This Scoop is a copy off our 82-93 S-10 Chevy pick-up hood (GM-828). It features the exact curve to match the 82-93 S-10 hood. Height is 2-1/4". Overall width in the front is 24". This 24" includes the flanges. Actual scoop is 21-1/2" wide at front (not including flange). Overall length 41 inches. Rear width is 26" at base (including flange). Actual scoop is 21" wide at rear / top. Curve: When placed on a flat surface, and viewed from the side, the center is bowed up between 1/2" to 3/4". 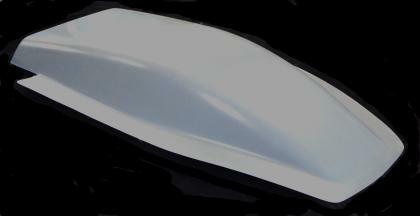 This Scoop is a copy off our 94-02 S-10 Chevy pick-up hood (GM-483). It features the exact curve to match the 94-02 S-10 hood. Overall width in the front is 24". This 24" includes the flanges. Overall length 43 inches. Height is 2-3/4". Rear width is 26" at base (including flange). Actual scoop is 21" wide at rear / top. Curve: When placed on a flat surface, and viewed from the side, the center is bowed up between 1-5/8" to 2". 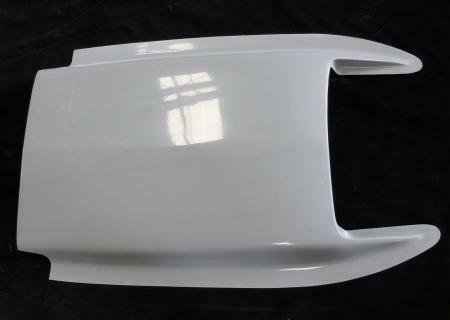 This Scoop is a copy off our 82-93 S-10 Chevy pick-up hood (GM-883). It features the exact curve to match the 82-93 S-10 hood. Overall width in the front is 24-1/2". This 24-1/2" includes the flanges. Actual scoop is 21" wide at front (not including flange). Height is 3-1/2". Curve: When placed on a flat surface, and viewed from the side, the center is bowed up between 3/8" to 5/8". This is a fully bolt on cowl induction scoop. Internal 2" wide flange for easy mounting. 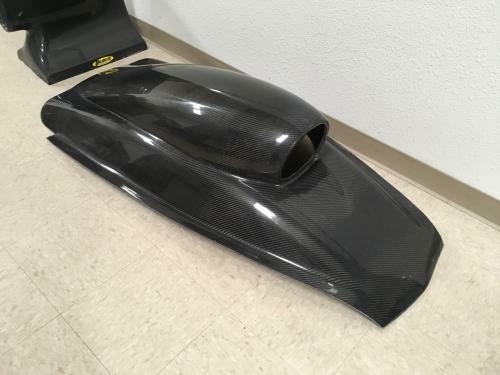 It will cover up the hole in your hood that was cut to accommodate the #SC284 aero-scoop. (the SC284 also mounts with internal flange). Short cowl induction scoop for bolt on applications. (28" long) Full inside flange for mounting to hood. bolts will not show. This is a shorter version of the SC116. Features smooth gel coat finish and can be easily painted to match car. The newest version of our cowl induction scoop line. This scoop features full inside mounting flange for complete bolt on application (bolts will not show). Smooth gel coat finish and reinforced rear opening. Side profile features slight curve to match contour of the hood. Overall width at front 22"
Overall length, down the middle 50-1/2"
Internal flange dimensions 2-1/2 wide along sides. 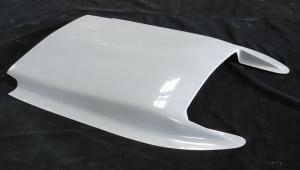 Entire scoop has a slight curve (when looking at it from the side view, this allows it to set neatly on almost all hoods, actual curve was taken from a 1969 Chevelle hood. Bolts and instructions are included. At the 22" point (as measured from the front), it is only 3-1/4" tall. These heights are the actual internal clearances also (as measured in down the middle of the scoop). SC-126 "Outlaw" Cowl induction scoop. Full 6" high. Cowl induction scoop for clearing high rise carburetor applications. Features external mounting flange for easy mounting to hood. SC-1263 Smooth top, no ridge. Entire scoop has a slight curve (when looking at it from the side view, mid point is bowed up 1-1/8"), this allows it to set neatly on almost all hoods. This item is too large to be shipped by UPS. We have excellent truck freight rates on this item. SC-228 8" Cowl induction scoop. Full 8" high. Cowl induction scoop for clearing high rise carburetor applications. Features external mounting flange for easy mounting to hood. 24-3/4 Wide X 55" Long. SC-129 "High Rise-Outlaw" A full 9 inches tall ! 65-1/2" long x 26" wide at high point. High point is 7-1/2" tall and is 39" from front. Rear is 4-1/2" high. Front width with flange 15", without flange is 12"
Height at rear is 4-1/2"
Front bottom of flange is notched to fit ridge on '55 hood.